The global soy protein market features a highly consolidated and competitive landscape with the top five players accounting for a combined share of over 66.2% in 2015, finds Transparency Market Research (TMR). These companies are Archer Daniels Midland Company, Cargill, Inc., CHS Inc., Willmar International, and DuPont. The top companies are making substantial investments in research and development activities to develop innovative products and formulations that adequately meet customers’ requirements in order to consolidate their shares, observes TMR. Leading players are also entering into new partnership agreements to expand their reach across major geographical regions. They are venturing into untapped markets of various developing economies by adopting the strategy of mergers and acquisitions. In terms of revenue, the global soy protein market stood at US$4.80 bn in 2015, and is forecast to reach a valuation of US$7.78 bn by the end of 2024. The market is anticipated to rise at a CAGR of 5.5% during 2016–2024. On the basis of geography, the major regions for the growth of soy protein market are Europe, North America, Asia Pacific, the Middle East & Africa (MEA), and Latin America. Of these, currently, North America leads the global market. However, in the coming years, Asia Pacific will rise at a higher CAGR of 6.8%. The impressive growth in this regional market is attributed to the soaring awareness of the numerous benefits of consuming soy protein products and the trend of veganism gaining traction across the region. 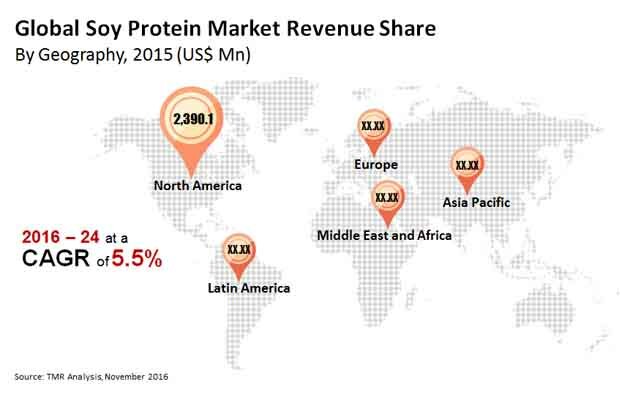 Based on product, the global soy protein market is segmented into protein isolates, protein concentrates, and protein hydrolysates. Of these, the soy protein isolates segment is anticipated to grow at the maximum CAGR along the forecast period and is expected to surge to 2,209.3 kilo tons, in terms of volume, by the end of 2024. The substantial demand is driven by its extensive use in milk beverages and as protein enrichment ingredient in a variety of products. The demand for various soy protein products is driven by numerous health benefits of soy protein. Prominent food regulatory agencies, such as the U.S. FDA, have upheld the fact that soy protein when consumed in moderate amount decrease the risk of cardiovascular diseases. In addition, the growing number of people adopting a vegan diet prefer soy protein as a viable substitute for animal protein. Furthermore, the increasing popularity of functional foods across a large part of population, especially in urban areas, has spurred the demand for soy protein products. In addition, soy protein is extensively used in making a variety of functional foods, such as meat, dairy alternatives, and energy bars. The soaring application of soy protein in the food and beverages industry is also expected to propel the market in the coming years. However, the marked difference between the supply and demand volumes of soy protein has hindered the growth of the market to some extent. In addition, the volatility in the availability of raw materials and the limited use of soy protein in the F&B industry have negatively impacted manufactures and vendors. Nevertheless, the growing application of soy protein in the nutraceuticals and functional food segments is expected to open up exciting opportunities for market players.